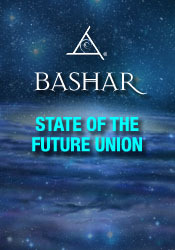 At this special "Evening with Bashar", Bashar explores the current state of affairs in our relationship with ET's and provides a future vision of what our world will look like. He shares a timeline for certain key events in our future until arriving at the unification of our planet. Specific information is given about our relationship with Canada, Europe and Asia. Q&A: The purpose of the guided meditations that Bashar does with us and how the experience helps you to integrate your consciousness. Do people have extraterrestrials for guides? Having panic attacks. Suppressive childhood with controlling, unemotional father and how the resulting patterns can be transformed. How to work with your ego and the negative emotions that come up in life. Creating a core belief about your relationship to the universe that can transform your experience. Global warming--is it a hopeless situation? Creating tools through shapes and the vibrations they represent and trusting your excitement to show you what tools to use. The energetic impact on the body of mercury tooth fillings. Being of a higher vibration through excitement and understanding how others may be uncomfortable as a result of your energy. What the 2012 gateway will represent to us as a planet. Changing to a parallel reality. The Four Laws of Creation. A discussion of open contact with extraterrestrials and the need for a planet wide protocol. Channelers as biological receivers. Was Jesus crucified and was he resurrected? The symbolism of Jesus dying for your sins. The symbolism of seeing colorful snakes in her meditations and dreams. How do I know if I am choosing my highest excitement? Repairing a torn ligament without surgery. Taking a talent for healing others to a higher level. Dream contact with extraterrestrials and then waking up abruptly in bed--was it real and the relationship to out-of-body experiences. The meaning and the purpose of seeing recurring numbers. Are we ahead or behind schedule for Bashar's previous predictions of ET contact? What is happening to the Earth's axis? Is there any way we can impact the change? Fear of channeling another entity and being effected by the "dark side". A detailed discussion of the channeling process that Bashar and Darryl go through in order for the transmissions to be possible. Is there a transparent sun? Where we will find life in our solar system. The importance of traveling to the places of your highest excitement. Healing arthritis.